Arcade action game, using the formula of hack and slash. Players play the role of a warrior in a tournament where the stake is the privilege of queen protection. While playing, we fight dozens of enemies in small and closed arenas, using more than 20 different weapons and combos. 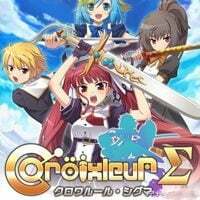 Croixleur Sigma for PC, PSV and PS4 is an arcade action game using the hack and slash formula, which focuses on a series of duels in small and separate arenas. The production, which is an extended and extended version of Croixleur released in 2013, is the responsibility of an independent Japanese development studio souvenir circ, which has so far released several fan titles in its homeland, embedded in the popular Touhou universe. The title was created for PCs and consoles and is inspired by series such as Devil May Cry. Croixleur Sigma takes players to the magical kingdom of Ilance, where, for centuries, aristocracy and knights have been trying to gain full political and military control. Instead of being bloody and brutal, the two factions solve the conflict of interest by means of a special tournament in which the most talented young warriors are put on display. The winner gives her group temporary control over the army and the possibility to protect the queen. At the beginning of the game players choose one of the participants and try to lead her to victory. The plot is presented in the form of short cut-scenes and offers several alternative paths and endings. Croixleur Sigma is a hack and slash action game reminiscent of Blood Palace mode from the Devil May Cry series. We observe the action from the perspective of a third person. Enemy battles take place in simple arenas built on a circle plan. On each of them we have to defeat a group of increasingly difficult monsters. The authors have prepared a rather complex combat system. Before starting the game, players choose four of the 20 available weapons (24 in the console version) to which special attacks are assigned. Defeated enemies leave behind coins, and collecting them allows you to get bonuses for the combo and unlock new techniques. More advanced players can use the ability to break the blows to avoid stoppages between attacks. The game also allows you to use a special jumping technique, during which the heroine becomes immune to damage for a fraction of a second. In addition to the fictional campaign, the creators also prepared other modes of play. In Time Attack we have to defeat enemies in a certain time, Survival requires us to survive as many waves of enemies as possible, and the Challenge poses specific challenges, such as performing an exceptionally long combo. The game also allows for a cooperation game for up to two people. The title offers a colourful visuals that don't impress, but do their job well at a constant speed of 60 frames per second.